College of Horticulture and Garden, Yangtze University, Jingzhou, China. Copyright © 2013 Longyi Yuan et al. This is an open access article distributed under the Creative Commons Attribution License, which permits unrestricted use, distribution, and reproduction in any medium, provided the original work is properly cited. Dendrobenthamia hongkongensis is an excellent ornamental tree species, which has a wide range in germplasm resources distribution and rich varieties within species in China and has also a great development prospect of the new superior species for city landscape. So it is necessary for us to do much research for the development and utilization of this species. According to the latest existing research data of D. hongkongensis, the research achievements of D. hongkongensis in Germplasm resource distribution, bio-ecological habits, breeding and cultivation techniques and so on have been analyzed and summed up. On the other hand, its Ornamental value has been utilized in the modern landscape. At the same time, Edible and Medicinal value of D. hongkongensis has been discussed in the paper as well as Material value of D. hongkongensis. In addition, the future aspects of physiological and ecological research, domestication and breeding new varieties, resource protection and landscape application of D. hongkongensis have been proposed. Dendrobenthamia hongkongensis, which is also called Dendrobenthamia capitata (Wall.) Hutch, is a genus of Cornaceae and evergreen tree, and has also a great development prospect of the new superior species for landscape planting. In addition, it has many advantages, for example: neat tree branches, evacuation, and beautiful crown, the whole tree view with the red and mauve leaves, white flower, red fruits in a fine landscape material all over the year. At the same time, it has the certain resistance against pests and diseases . Recently, when people all over the world have emphasized on the protection in the diversity of germplasm resources, our country have also further strengthened trees’ greening ecological value in human habitat environment. With the increasing demand for garden trees, the demand of high ornamental value of D. hongkongensis will also be increased dramatically. This article has collected many researches of its distribution [2-9], morphology, germplasm resources, group development and utilization and has looked up relative literatures of D. hongkongensis at least in the present study [10,11]. We have found the researches about D. hongkongensis are still in the primary research stage. Therefore, the author has summarized researches about D. hongkongensis in the past and has proposed its future research direction, in hoping for providing good landscape of colored leaf trees for city greening projects and human ecological environment. According to the Plant Index of China, D. hongkongensis species have a wide range in germplasm resources distribution and rich varieties within species. Dendrobenthamia plants are widely distributed in East Asia, North America continent and so on . Dendrobenthamia plants in East Asia and the North American continent which have grown in moist valleys jungle as well as mixed forest, are mainly distributed in the 800- 1600 m above sea level in the forest and in the edge of valley streams . East Asia Dendrobenthamia species have some distribution in china, and their beautiful edible aggregate fruits(pulp quality drupe) are different from those of D. hongkongensis species in North America. D. hongkongensis species in China are widely distributed in Jiangxi, Fujian, Guangxi, Zhejiang, Yunnan, Hunan, Guizhou, Sichuan, Guangdong province and other places, wild populations of more species can be used as a timber, ornamental, brewing, pharmaceutical, and other multikinds of uses. Dendrobenthamia plants are temperate species which adapt to the sunshine, the warm climate and humid environment, grow very well in fertile and well drained sandy soil, and have a strong adaptable response to the environmental stresses. In addition, those species have good ability to adapt to the drought and barren resistance in a certain degree, especially the low temperature 15˚C below zero. However, their leaves will droop in direct sunlight, and plants grow very slowly. Besides, no strict requirements are needed, they can grow normally in neutral, acidic and lime soil. In natural forest and pine community, mixed with Huashan pine, oak, hazel tree species, Dendrobenthamia species are often distributed in the upper canopy [1,7-9]. 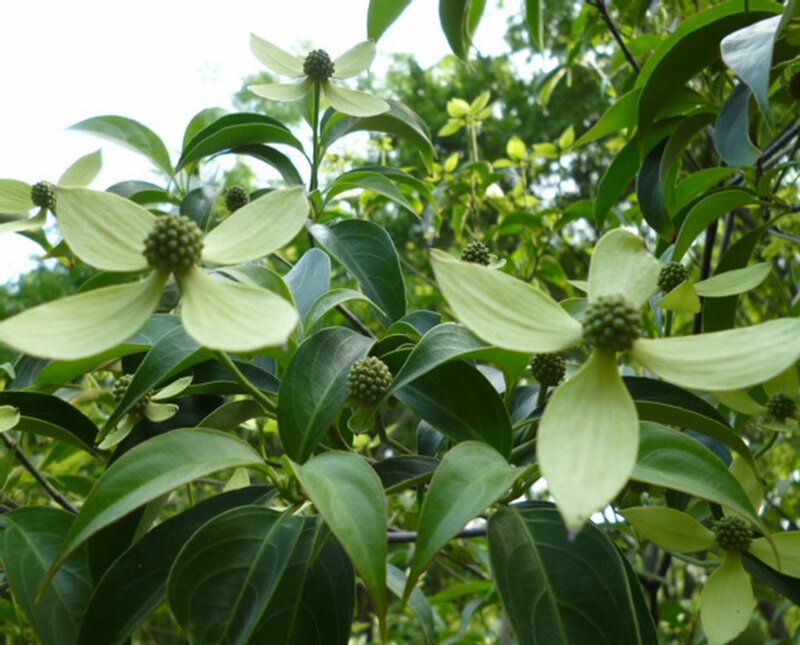 D. hongkongensis species can bear under shaded by other tree species, be fond of the full light, warm condition and humid climate, endure a certain cold environment, survive under the 15 celsius degree below zero, and grow normally in neutral, acidic and lime soil. According to the newest research , seeds of D. hongkongensis species start to germinate at the end of March, their leaves start to sprout from the tree branches in early April, their flower buds begin to form in late April and the flowers will bloom from in the mid-May to the early June. Their fruit mature stage is in the middle of November. After the fruits mature for about 10 days, they are gradually scattered from the end of November to December. The fruits are a kind of collective fruits with a red skin in mature stage. D. hongkongensis species undergone about eight years can blossom flowers and bear fruits, even more than 20 years. The year phenomenon about bearing fruits is not significant. According to regular observations during the growth of the one-year-old D. hongkongensis seedlings, the result showed that the growth peak of those seedlings was about from June 21st to September 20th, and ground diameter growth peak was from June 21st to September 10th. The height growth type of D. hongkongensis Seedlings belonged to the whole period growth form, their peak season of high growth was about 41.07% of the total annual growth period, and the growth accounted for 67.67% of the total annual increment. Seedlings height growth and diameter growth of narrow leaf species of D. hongkongensis followed an “S” type growth law. So the logistic equation was used to fit the seedling height, ground diameter growth process [10,11]. The fruit of D. hongkongensis species is an aggregate fruit with A spherical shape and a red color, which is hidden in the development of receptacle and a ball of healing in the ear (Figure 1). Its diameter is about 2 - 2.5 cm and total fruit pedicels is slender, with length of 5.5 - 6.5 cm. fruit color is yellow and green during an immature period, while it is from yellow to red during mature period. The fruits have 1 - 5 cores per fruit, which are Flat, oval or irregular-shaped, and are composed of reddish brown upright embryo and abundant endosperm . Figure 1. The flowers of D. hongkongensis. because D. hongkongensis seed coat is very compact. The seeds being sowed begin to germinate after two years. the seeds are treated to be soaked and grinded to decrease oil skin, and then be grinded wax leather by the sand. In production practice, the seeds are also laminated in wet sand storage. Before 20 days, the seeds have been soaked in 5 g/L potassium permanganate solution for 2 hours and removed, then rinsed and soaked with warm water about 50˚C until the water temperature is cooled naturally. Those seeds have been soaked in cooled water for 36 hours, then get out to be germinated under heating condition, under which the temperature will be controlled to 25˚C. During the seeds germination, diligent observation, flip, a small amount of water and keeping the seed moisture should be done, then the seeds can be planted about 20 days, the seeds soaked in warm water will germinate very faster and tidier. According to the ecological characteristics of D. hongkongensis, its breeding can be divided into seed breeding, tiller law and cutting method of asexual reproduction, and made a detailed introduction of its production practices . the quantity of the seedling is big by Seed breeding nursery, but it passes through a long life cycle. seed propagation and cutting propagation of D. hongkongensis are studied . on the one hand, the study of Seed propagation of D. hongkongensis includes seed harvest, seed treatment, soil preparation for breeding, seeding and management. On the other hand, cutting propagation of D. hongkongensis is generally begun from in September to October in autumn as well as in March in spring. Firstly, Robust 1, 2-year branches of mother trees of D. hongkongensis are chosen to be cut into 15 cm cuttings with 2 buds, cut into the horses-ear-shaped cut below the branch, and treated with auxin or ABT. Then seedling bed is first irrigated with water and the branches are cut on the seedling bed and inserted deep about 2/3 cuttings. When seedling height can reach up to more than 20 cm, those asexual seedlings are transplanted out of the nursery. But the study on how to standardize sexual and asexual seedlings of D. hongkongensis is a hot problem. In the future the problem will be further studied. According to ecological and biological characteristics of D. hongkongensis species, as well as practical experience in the cultivation, cultivation techniques in the planting and management of D. hongkongensis species are summarized [4,13]. D. hongkongensis species are suitable in the shading habitat, so their cultivation should be selected in the damp, moist, fertile and higher underground water level environment. The research shows that cultivation time of D. hongkongensis species is much better in the spring than in the autumn. When they are transplanted, they can survive as possible as the trees keep more balling and less roots cutting. If transplanting D. hongkongensis species happens in the growing season, firstly, the leaves on the branches should be get rid of to maintain the balance of water metabolism and the soil in the surrounding of trees should keep moist. Secondly, loosing the soil and killing the weeds are good for the growth of root and yields of shoot. Then the basic fertilizer is fertilized in the early spring, and top dressing is carried out in the late autumn. Usually, fertilizer is dominated by the decomposed organic fertilizer. Sometime industrial fertilizer is applied in the rapid growth period. Finally, tree pruning and training is conducted at regular time, and the principle of trim is to short cutting the branches. At the same time, inner delicate branches, branches with diseases and pests and bad branches should be cut off every year to keep the trees centralize the supply of nutrients for promoting the growth of D. hongkongensis species. Of course, the standarded cultivation and cutting techniques D. hongkongensis species will be studied and popularized next time. The study on the plant physiological and biochemical indexes of D. hongkongensis was contributed to its adaptability cultivation and resistance exercise [8,10]. When Dendrobenthamia species encountered a cold environment, they would improve the content of soluble sugar in the plants resistant to cold. Because the Soluble sugar in plant bodies can reduce plant freezing point, buffer excessive dehydration and protect the colloidal cytoplasm from solidifying, the increase of soluble sugar content is an indicator of plant against the cold temperature. For example, D. angustata samplings in the frozen stress such as 15˚C below zero for 48 hours, plants was damaged a little. When they encountered such an inadaptable extreme environment for 72 hours, all or parts of those samplings were frozen to death. Soluble sugar, MDA content and POD activity were higher in all treatments, while MDA content was the highest at −15˚C for 48 hours [14-16]. Those results showed Dendrobenthamia species had some strong characteristics against the cold temperature. Therefore, it is crutial for us to study Dendrobenthamia species further for landscape application in the future. Plant tissue culture helps to increase the diversity of the breeding, change the mode relying solely on conventional asexual reproduction and accelerate the propagation of seeds and seedlings. To some extent, this tissue culture also maintains the ecological balance and protect the short, rare and endangered species . Dendrobenthamia species tissue culture was rarely studied. The tissue culture pollution control, shoot tips multiplication culture and the browning control culture of the endangered plant D. wemeiensis as well as the callus was preliminarily stuied. Tissue culture of seedlings of D. wemeiensis appeared to fill the blank Dendrobenthamia species . But there were so many shortcomings in tissue culture study on D. wemeiensis to carry out a large-scale factory production, such as slow growth of D. wemeiensis tissue culture, easily browning higher rate of pollution. Therefore, Tissue culture research on Dendrobenthamia species should be further studied and discussed. Afforestation time of D. hongkongensis uaually happens in spring and autumn. When the seedlings of D. hongkongensis can be planted in the soil before the buds sprout from March to April, the plants of D. hongkongensis can be planted from October to November after falling leaves in autumn. According to the biological characteristics of D. hongkongensis, the shrubs woodland with thick, moist soil, the land in the lower part of the barren hills and wasteland with loose, deep sandy loam or loam soil in wet environment and moist fertile mountain can be chosen to tend of D. hongkongensis forest. If acres of afforestation are implemented in the wasteland, the land will be terraced by contour anti-slope way. The field is about one meter wide and four meters spacing. Combined with cultivating timber and nurturing urban greening trees of D. hongkongensis, the colonization density of D. hongkongensis will be resolved. It is appropriate that initial planting density of D. hongkongensis is 660 plants per acre, with a space of one square meter per plant. 3-year seedlings will be transplanted to the land, between which the suitable row spacing is about one meter. With the whole land preparation methods, the plants of D. hongkongensis should bring the soil ball to plant in the holes. In the planting process, it is key techoniques for the survival of trees not to hurt the roots, make roots naturally stretch, keep the trees upright and water completely the trees at once. In the Growing season, plants transplantation of D. hongkongensis should remove all leaves that year, make soil ball well, keep the balance of water metabolism and keep the soil moist after planting. Moreover, tending techniques of D. hongkongensis should be strengthened in the surviving season. It is necessary for seedlings to clear the weed in the field and loose the soil. Those seedlings are tended twice a year until they form the young forest canopy. At the same time, watering and fertilizing is conducive to the growth of those trees [7,8,19]. If those trees are tended to be landscaping trees, the trees should be taken heart, picked the buds and pruned to cultivate beautiful shape. Then the trees will grow so as strong to bear fruit after 8 years. D. hongkongensis is an excellent ornamental tree species. The tree form keeps round, like an umbrella. Early summer the trees are full of flowers, in which petaloid bracts are big and white, lined in light green leaves (Figure 1). When the wind blows, those flowers like butterflies dancing, whose landscape is very unique. In Autumn ripe fruits with red and purple color are very bright, whose shape like the fresh litchi fruits can be ornamental and edible. When temperatures decrease in winter, leaf color of D. hongkongensis species gradually turns red in the green trees, and this landscape is a particularly stricking until the spring comes. The species have a great prospect for development and utilization of the local foliage, flowers, fruit garden green Trees and ornamental tree species. They are applied in modern forms such as olitary planting in front of yard, hillside, booth, pavilions or clump planting on the lawn, near the roadside, forest margins, pool etc. Then the leaves of D. hongkongensis species can be enjoyed in spring, as possible as the flowers in summer and red leaves and fruits in winter. The fruits of D. hongkongensis contain a lot of nutrition, rich in protein, vitamin and fiber. Their fresh flesh can be eaten, which is made to wine and vinegar also. So the development and utilization value of the wild fruits can be available to human beings. Each part of D. hongkongensis may be medicinal. Firstly, fruits medicine can warm stomach, stimulate the menstrual flow and improve blood circulation. Secondly, Fresh leaves make the wound detumescence. Finally, roots and seeds can be Fried to be water enriching the blood, which makes women’s menstrual disharmony abdominal pain cured. The excellent timbers of D. hongkongensis are so hard, straight and delicate texture that they can be processed easily to the high-class furniture. Now the material value of D. hongkongensis is being fully valued and used in the industries. Recently, the flower research hotspots in the world have focused on the germplasm resources, genetics and breeding, postharvest physiology and flower production technology. Combined with the present study of D. hongkongensis species, their future research should focus on the following aspects. The present report about physiological ecology research of D. hongkongensis only involves climate factors and frozen stress studies, while the research about secondary metabolism, nutrition, water, physiological and ecological aspects of D. hongkongensis species is still blank. Therefore, the research of D. hongkongensis species should discuss their ecological and physiological characteristics, and the reliable theory basis will be founded to serve for the introduction, domestication and cultivation management of D. hongkongensis species. At present, domestic common cultivated species is D. japonica, D. mulinervosa, D. elegans, D. gigantea, so it is necessary to introduce and acclimatize the wild flowers resources of Dendrobenthamia species widely. the biology characteristics and ecological habits of Dendrobenthamia species should be researched. Then the survival rate of introduction about Dendrobenthamia species will be improved, and those acclimatized Dendrobenthamia species will adapt to the new environment. Besides , it is necessary to strengthen the foundation of new breed seed selection. with genetic engineering and molecular techniques, the study on the color, flower type, flower shape, life-history strategy and genetic regulation, locate ornamental characters and resistance gene of Dendrobenthamia species should be further researched, as same as on breeding process tracing. If the abundant local resources of Dendrobenthamia species is made full use, the ornamental and utilization value of more varieties will be cultivated . Because of any various plants of the species endangered, based on the resource investigation of D. hongkongensis, the future study on D. hongkongensis resources will be carried out in their genetic diversity research. At the same time, traditional biological observation and molecular marker technology should be combined into exploring the interspecific relationship and genetic variation characteristics and endangered factors of D. hongkongensis. According to the genetic structure of D. hongkongensis and its biological characteristics, the corresponding protection measures will be carried out in the future. At the moment, the applied research of D. hongkongensis species is rare, especially in landscape application. In the future, those D. hongkongensis species should be strengthened in the landscape application, such as in the city greening project, landscaping project and other plant configuration form. In conclusion, D. hongkongensis is an excellent ornamental tree and landscape species. According to the origin and variety of D. hongkongensis species, the resources of D. hongkongensis should be collected immediately to set up the largest species resource nursey in the world to protect those wild resources of D. hongkongensis species. Then the research on the species breeding and selection of D. hongkongensis should be done so as to develop many new cultivars to use. Moreover, those cultivars should be carried out to accilimate the local environment so that the adaptable cultivars should be selected out to be cultivated in the nurseys. Finally, a large number of promotion of this species should be put into practice in order to use widely those cultivars of D. hongkongensis in city landscape construction which makes great contribute to improve the environment and promote the quality of live for human, develop their more medicinal and material value than ever before in everyday life as well as edible value. Financial support was provided by Chinese National Natural Science Fund Project (31170400), Natural Science Fund Project of China Hubei Provincial Science and Technology Department (2010CDB04402), Science and Technology project of Hubei Provincial Department of Education (B20111305) and Opening Project of Key Laboratory of Aquatic botany and Watershed Ecology, Chinese Academy of Sciences (2011003). P. F. Wen and G. You, “Flora of China,” Vol. 15, Science Press, Beijing, 1999, 56p. D. H. Wei, “Germplasm Resources and Its Exploitation and Utilization of Dendrobenthamia,” Resources of Wild Plants in China, Vol. 11, No. 2, 1993, pp. 37-40. D. H. Wei and M. Xiu, “Determination of Nutritional Components of Dendrobenthamia Fruit,” Journal of Fujian Forestry College, Vol. 13, No. 3, 1993, pp. 311-313. H. Y. Jun, “Cultivation Techniques of Dendrobenthamia,” Special Economic Animal and Plant, Vol. 5, No. 1, 2002, p. 34. J. C. Tian, “Dendrobenthamia,” Chinese Flowers Miniascape, Vol. 21, No. 9, 2005, p. 32. H. C. Chang and Y. Lei, “Species of Wild Ornamental Plants in Gansu,” Resources of Wild Plants in China, Vol. 24, No. 3, 2005, pp. 29-31. M. Y. Yong, Y. Li, et al., “Dendrobenthamia angustata Annual Preliminary Study on the Annual Growth Rhythm of Seedlings,” Jiangsu Agricultural Sciences, Vol. 33, No. 5, 2005, pp. 77-78. M. Y. Yong, T. Z. Ying and Y. Li, “Climatic Factors of Dendrobenthamia angustata Seedling Annual Growth Rate Influence,” Anhui Agricultural Science and Technology, Vol. 33, No. 11, 2005, pp. 20-33. X. T. Lv and Y. Z. Jing, “Cultivation and Management Technology of Dendrobenthamia,” Garden and Flower, Vol. 6, 2006, p. 38. M. Y. Yong, H. Zheng, et al., “Dendrobenthamia angustata Seed Germination Test,” Journal of Hubei Institute for Nationalities (Natural Science Edition), Vol. 22, No. 3, 2004, pp. 68-70. M. Y. Yong, H. Zheng, et al., “Germination Experiment According to Spend Four and Dendrobenthamia angustata Seeds,” Forestry Science, Vol. 33, No. 4, 2004, pp. 17-19. W. X. Da and Q. Z. Chang, “Investigation of Yunnan Have No Quantity Mountain Primula Germplasm Resources,” Acta horticulturae Sinica, Vol. 30, No. 4, 2003, pp. 476-478. C. C. Xi and G. Z. Zhen, “Use and Breeding Technology of Flowers of Dendrobenthamia,” Forestry Science and Technology, Vol. 17, No. 3, 2003, pp. 50-51. K. S. Liang and G. Z. Fu, “Preliminary Study on Endangered Medicinal Plant Resources of Mount Emei,” Resources of Wild Plants in China, Vol. 22, No. 3, 2003, pp. 21-23. S. L. He, “The Principle and Technology of Plant Physiology and Biochemistry Experiment,” Higher Education Press, Beijing, 2000. C. Peng and M. Y. Yong, “Effects of Freezing Stress on Physiological Characteristics of Narrow Leaf Sizhao Seedling Malondialdehyde,” Journal of Hubei Institute for Nationalities (Natural Science Edition), Vol. 25, No. 2, 2007, pp. 192-194. Z. P. Rui, “Plant Tissue Culture,” Guangdong Education Press, Guangzhou, 2000, 15p. L. Hui, “Endangered Plants in Emei Four According to Cultivation of Flower,” Gansu Agricultural University, Lanzhou, 2007, pp. 39-40. H. Z. Yu, Z. T. Guo, et al., “Determination of Dendrobenthamia angustata Main Nutritional Composition,” Journal of Hubei Institute for Nationalities (Natural Science Edition), Vol. 20, No. 4, 2003, pp. 21-22.